Don’t you just love it when a homeschooling lesson happens out of the blue and you don’t have to plan it?! That is what happened to us the other evening. Hannah and Caleb were outside playing when Caleb comes rushing in yelling, “Mum! Mum! Come and look at this! QUICK!” Of course I had NO clue what I was going to look at but got a very pleasant surprise. 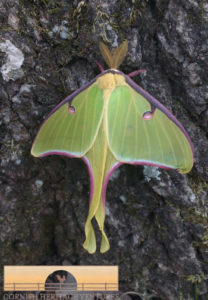 On a tree close by was this beautiful Luna Moth. (These moths are LARGE!) Okay, so I admit, I didn’t know what kind of moth it was and am thankful for Wikipedia on my phone 🙂 This is the first time we had ever seen one in the wild/real life and there is a reason for that. According to Wikipedia, although Luna Moths are very common, they are rarely seen as they only live for seven days. They do not eat during this time and do not have mouths. Their one goal in that seven days is to find a mate. I’m pretty sure this one we saw was a male as its antennae were wide. Amazing creation! Hope you enjoyed our quick but interesting science lesson. This entry was posted on Saturday, April 14th, 2018 at 3:58 pm	and is filed under Science. You can follow any responses to this entry through the RSS 2.0 feed. You can leave a response, or trackback from your own site.